Following nearly three months of filming, it is reported that director Todd Phillips has wrapped the Joaquin Phoenix Joker movie. The Daily Mail offers Joaquin Phoenix was spotted for the final time in New York City as both of the character he plays, with the make-up wearing Joker and his "normal" alter ego, Arthur Fleck. Set pics include the 44-year-old Phoenix on a stairway in Brooklyn with Zazie Beetz, who plays his reported love interest, Sophie Dumond. The scene also involves Beetz on the stairway with a young child. Details for the Joker movie include that it is set in the 1980s in Gotham City and is a standalone film not a part of the DCEU. 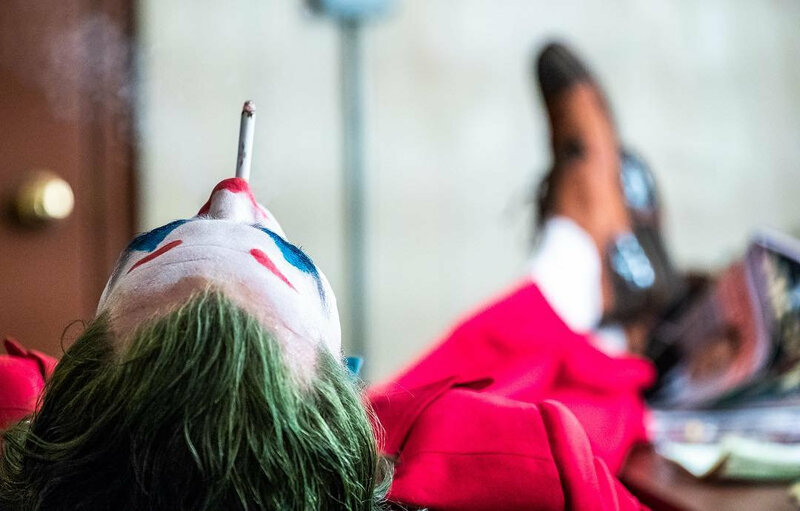 The official description offers the Joker origin movie centers around the iconic arch-nemesis of Batman and is an original, standalone story not seen before on the big screen. Phillips’ exploration of a man disregarded by society is not only a gritty character study but also a broader cautionary tale. The film follows the transformation of a struggling stand-up comedian to a full-blown criminal force of nature. The movie also stars Robert DeNiro as a talk show host, Marc Maron is the agent responsible for getting the Joker on DeNiro's talk show, with the film also starring Frances Conroy, Josh Pais and Bret Cullen as Thomas Wayne.